By default, exported documents and files (e.g. payslips, P30s, reports, pension CSV files, journals, snapshots, etc.) are automatically organised into a separate folder structure for each of your clients. With this structure, all documents and files are placed in a folder called Client Name - Documents (e.g. ABC Limited - Documents), which is saved in the same location as the employer data file. Within each Client Name - Documents folder, additional folders are created entitled Payslips, P30s, Reports, etc in order to organise the various types of documents and files available for export. If you don't wish exported files and documents to be automatically placed into these organised folders, this feature can be turned off. 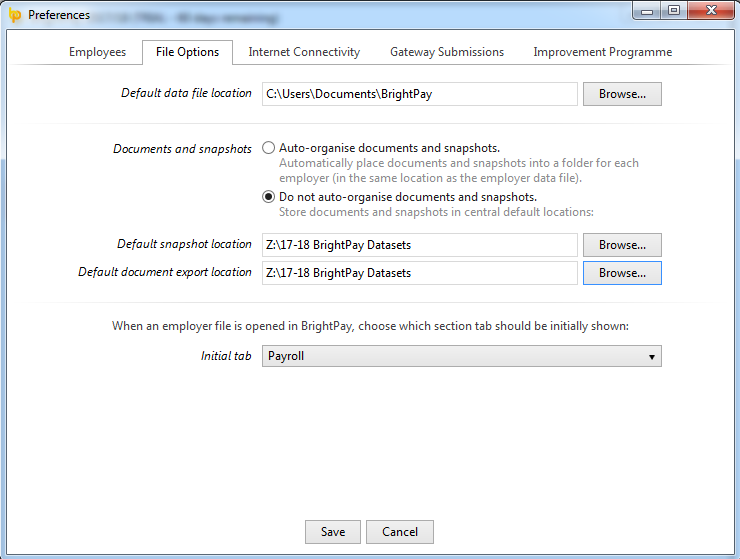 To instruct BrightPay not to do this, simply right click on the open employer screen and select 'BrightPay Preferences > File Options > Do not auto-organise documents and snapshots' . Users can then choose to set a location of their choice for all document exports.